The University of Virginia football program entered Friday night’s matchup with Pittsburgh ranked in the Top 25 of the Associated Press and coaches’ polls for the first time since 2011. Additionally, the Cavaliers controlled their own destiny in the Atlantic Coast Conference Coastal division. But under the Scott Stadium lights, the Cavaliers simply couldn’t find the form that helped them achieve nationally-ranked status and a prime spot in the conference race. 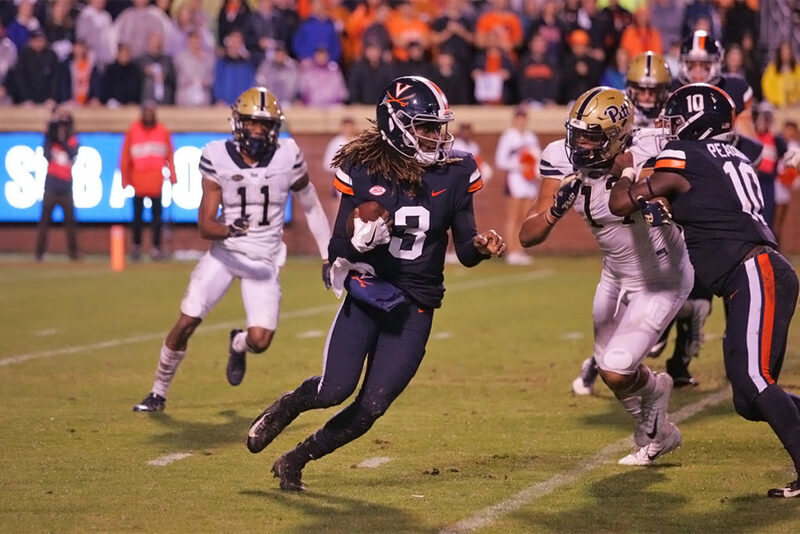 Penalties – Virginia was flagged 10 times for 80 yards after averaging only 4.3 penalties per game prior – highlighted a sloppy night for Virginia football, particularly on offense, and the Hoos fell to Coastal Division foe Pitt, 23-13. UVA drops to 6-3 on the season, 4-2 in conference play. Virginia’s struggles surfaced in the game’s opening five minutes. In what was nothing short of a torrential downpour, Cavalier junior wide receiver Joe Reed dropped the opening kickoff, picked up the ball, was hit and fumbled before tight end Evan Butts made the recovery. UVA squandered a 1st-and-10 at its own 43 by picking up back-to-back penalties – the false start and holding calls were two of three flags on Virginia that opening drive – that would lead to a punt. Pitt took advantage of Virginia’s scoreless opening sequence as well as clearing skies with an 8-play, 84-yard scoring drive on its first possession of the game. Senior running back Darrin Hall, who rushed for over 100 yards against Virginia last year, burst through the line and ran 41 yards to the end zone to give the visitors a 7-0 first-quarter lead. After a rough start, the complementary football Virginia had exhibited so well in wins in its previous three contests seemingly returned, beginning with a Reed 37-yard kick return, which, coupled with a personal foul call on Pitt, resulted in the Hoos having possession at the Panther 42. The very next play, junior quarterback Bryce Perkins threw a beautiful pass down the sideline to seldom-used sophomore receiver Terrell Jana, who hauled in the throw in stride and cruised in for a 42-yard touchdown, the first of his collegiate career. Pushed around on Pitt’s opening drive, the Cavalier defense responded to the challenge by forcing the Panthers to punt on their next four possessions. Meanwhile, the Virginia offense struggled to put up points after the big touchdown play. The usually sure-handed Butts fumbled on a 4th-and-4 at the Pitt 31, ending a promising second-quarter drive. UVA would secure a 10-7 halftime lead when placekicker Brian Delaney booted through a 29-yard attempt in the final seconds of the second quarter. Just as they had the week before against UNC, the Virginia defense held Pitt to a punt to start second-half action. Unlike last week, Perkins and company did not drive down the field and score a touchdown. UVA managed only eight yards on six plays on its opening second-half possession before having to punt. Offensive tackle Ryan Nelson’s false start and a dropped pass by junior running back Chris Sharp on an open wheel route led to the demise of the drive. On the ensuing possession, Virginia’s defense appeared to stop Pitt for a fifth straight drive when junior quarterback Kenny Pickett was tackled for a 3-yard loss on 3rd-and-11 from the Panther 15. Sophomore linebacker Elliott Brown was flagged for a personal foul horse collar tackle. The penalty, while controversial at first glance, appeared to be the right one and it gave Pitt new life. The Panthers would convert three more third downs on its way to a 15-play, 84-yard drive capped off by a 2-yard touchdown run by Hall. The visitors took a 14-10 lead after an Alex Kessman extra point. What made Pitt’s second touchdown drive more difficult was the fact that, after the horse collar penalty, UVA saw two of its starters leave the game due to injury. Sophomore defensive lineman Mandy Alonso and sophomore safety Joey Blount both left the field in obvious pain from leg injuries and would not return. The Cavaliers had lost starting safety Juan Thornhill in the first half due an ankle injury. Thornhill returned to the field with a walking boot on his left ankle. Despite its struggles, Virginia pulled to within one on a 42-yard field goal by Delaney with 9:51 remaining in the game. Hall struck again, though, bursting through the Cavalier defense for a 75-yard touchdown on the next drive. A fumbled extra point kept the Cavaliers within seven at 20-13, but the Virginia offense finished the game with a punt followed by a turnover on downs. Meanwhile, a Kessmann 53-yard field goal with 4:25 remaining gave Pitt its final 10-point edge. Coach Bronco Mendenhall has stated several times in recent weeks that these games come down to only a handful of plays. Friday night, it was Pitt (5-4, 4-1) making those plays and coming away with an important victory that puts the Panthers in first place and in control of its own destiny in the ACC Coastal Division. An average Panther defense that surrendered 45 points to Duke the previous week controlled the line of scrimmage and dominated a potent Virginia rushing attack, limiting the Hoos to 44 yards on 26 carries. Cavalier senior running back Jordan Ellis managed 46 yards on 10 rushes, but 22 of those yards came on a burst up the middle in the fourth quarter. The Panthers defense harassed Perkins with five sacks and held him to minus-7 yards on 15 carries. Virginia’s signal caller completed 17-of-24 passes for 205 yards and a touchdown; however, he was 7-of-11 for 36 yards in second half play. Jana led the Cavaliers with 71 yards receiving while senior Olamide Zaccheaus was held to just four receptions for 31 yards. OZ had only 36 yards of offense on the night. Limiting Pitt’s rushing attack was a key for the Cavaliers coming in, and, outside of Hall, the Panthers had 31 yards on 20 carries, including 24 yards on seven attempts by leading rusher Qadree Ollison. But Hall had a huge day, rushing 19 times for 229 yards and three scores. Virginia had allowed only 58 and 66 yards rushing in its previous two games, against Duke and UNC, respectively. Pickett completed only 7-of-14 passes for 61 yards, but it was enough to get the win. He was sacked three times by the Virginia defense, with linebackers Charles Snowden and Matt Gahm and cornerback Bryce Hall each picking up a sack. Virginia, which was led in tackles by Blount with 11, totaled seven tackles for loss. In his return to a starting role, junior linebacker Jordan Mack had six stops (1 solo). Sophomore Rob Snyder, who had performed admirably in Mack’s absence, did not play because of an undisclosed injury. Whatever the case, Virginia’s “New Standard” was not met against Pittsburgh on Friday night. The Hoos will look to get back on track when Liberty comes to Scott Stadium next Saturday, November 10. Kickoff is 3 p.m., and this will be the Cavaliers’ final home game of the 2018 season.